Ethan is finishing Day 11 of his most recent hospitalization. The severe pain has been successfully managed and he is weaning off the pain med combination that delivered the much-needed relief. As good as this news is, there are challenges still ahead before discharge. 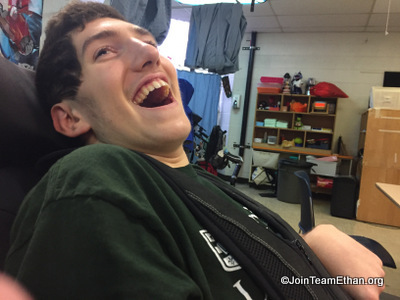 Ethan needs to prove he can receive nutrition and hydration through his GI System – typically not an easy task for him. The other challenge is more mental. Given we do not know exactly what caused Ethan’s severe pain event on April 27, we cannot be confident it will not return. Add this to a long list of potential issues that could send Ethan back to the hospital at any time. Not an easy way to live for Ethan or for us. This will be a very busy week – Ethan will remain at Cincinnati Children’s Hospital until he demonstrates GI success, Alexia will pick up Zakary who is finishing his sophomore year at Washington University in St. Louis, and Scott and Elyse will try to have a typical/not-typical week at home. We will all juggle our commitments at work, home and the hospital. With so many unknowns, this current admission has been very challenging emotionally. Not understanding the source of Ethan’s severe pain is scary. It creates a lot of worry. As of today, Ethan has spent a total of 373 days in the hospital, and counting, since his injury on June 29, 2013…that’s 26.5%, a statistic that is unimaginable! We hope the flicker of light we see grows stronger this week. We all need Ethan to get well and come home. This time, I ponder how games that don't really feature death make me feel, and how the prospect of living forever can be just as scary as dying. Click here to read the full thing.